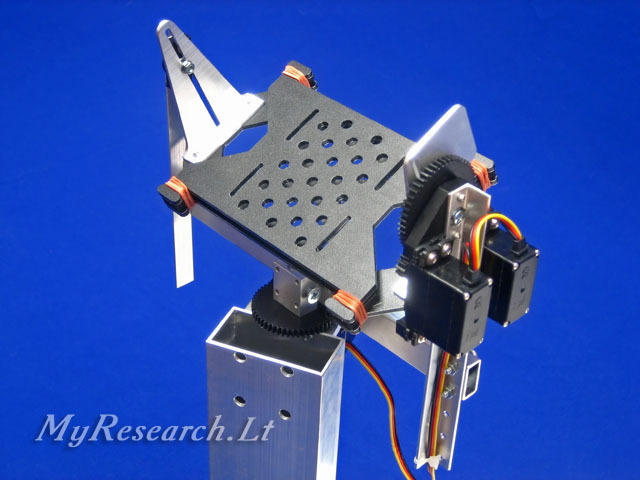 While stabilizing the swinging camera, the servo-drive must often change the direction of rotation. The camera experiences the jolts of small amplitude as the result of operation of the servo-mechanism. Even if one succeeds to eliminate flickering of the camera through the digital processing of the video-material, the view precision still worsens, particularly in case of shooting in insufficient lighting and the elongated exposure of the shot. The amplitude of undesired oscillation is related with the following reasons: the sum of clearances in the gearbox of the servo-drive, the sum of clearances in the places of coupling of the support, insufficient rigidness of the construction, delay of the servo-mechanism's reaction towards the signals of the sensors of positioning. Swinging of the camera, increased by the servo-mechanism, is one more drawback, which often occurs. The video-camera does not stop at the expense of inertia in the set point after rotation because the mass of the video-camera is considerable. The servo-mechanism starts to rotate the camera towards the set position as the result of which swinging increases. The purpose of the invention: To reduce the undesirable oscillation of the video-camera in case of usage of the servo-drive. The task is solved as follows: two servo-drives are installed on each axle of rotation. 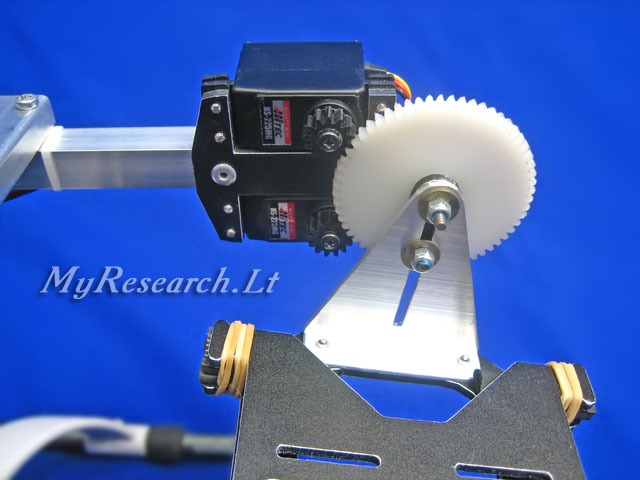 The servo-drives operate synchronically in the course of rotation of the camera, but, being in the neutral position, they create an extra loading in the opposite directions. As the result of it, the clearances in the transmission become compensated and the jolts become eliminated at the moment of change of the direction of rotation. Besides, delay of the reaction towards the control signal also reduces. Double servo-drive is usable for smooth control and stabilization of a video camera. Double servo-drive eliminates free movement and enables avoiding of shake of the camera caused by operation of the electronic gyroscope. Double servo-drive can be made of two ordinary servo-mechanisms. The servo-mechanisms, modified for turning for 360 degrees, are used in the camera gimbal. The both servo-mechanisms are connected to one control channel. In case of the neutral control signal, the conjugated servo must rotate slowly to the opposite sides. An electronic synchronizer may be applied for synchronizing of the servo-mechanisms. Such devices are being produced by several companies, but it is possible to manage without it. 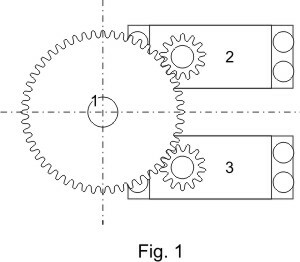 The speed of the servo without the load is fixed by the potentiometer, which is disconnected from the gears. The preliminary tuning may be done as follows: fix the control signal at -2 % from the neutral position and achieve halt of the first servo; fix the control signal at +2% from the neutral position and achieve halt of the second servo. If You have such possibility, it is desirable to measure the current, which is consumed by the servo in case of stoppage of the motor by force, while tuning. Start tuning from the low current, for example, from 20 mA. The assembled servo-mechanism without the load rotates very slowly at such current. 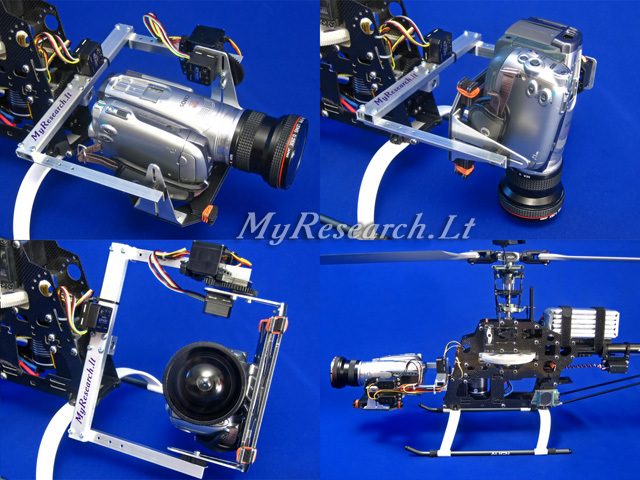 If the heavy camera is fixed on the gimbal and its center of gravity does not coincide with the rotation axle, it will be necessary to increase the load upon the servo-mechanism artificially, seeking for stabilization. The excessive load will cause breakage of the servo-mechanism. Thus, pay more attention to the balanced condition of the whole mechanism; it must not swing as the pendulum.